The list of global companies being drawn into a vast graft scandal in South Africa is growing. McKinsey is the latest to be implicated after the country's main opposition party filed criminal charges of fraud, racketeering and collusion against the consulting firm on Tuesday over its alleged ties to a prominent family accused of misusing state funds and improperly influencing the government. The scandal, which revolves around the wealthy Gupta family, has already ensnared tech giant SAP (SAP) and audit firm KPMG, and led to the collapse of London-based public relations firm Bell Pottinger. McKinsey stands accused of ignoring warnings from senior staffers that dealings with companies linked to the Guptas were not above board. It says the criminal charges, which can be filed by individuals or organizations under South Africa's legal system, are without merit. South Africa's National Prosecutor's Office must now decide whether to take up the case. "We have not engaged in corruption or paid bribes," McKinsey said in a statement. "Neither the Gupta family nor any company publicly linked to the Guptas has ever been a client of McKinsey." 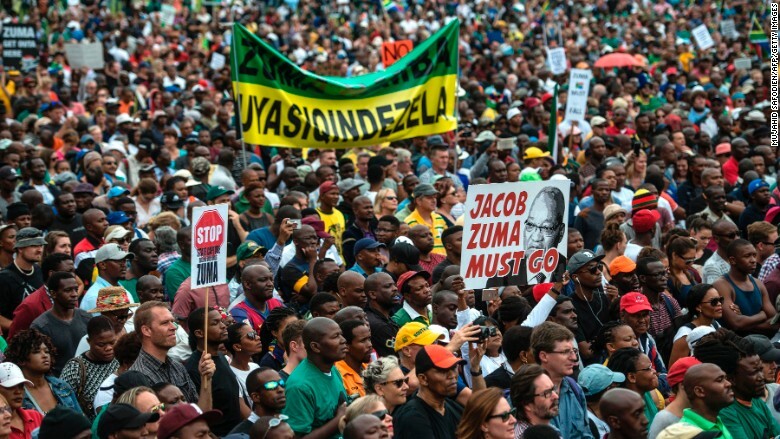 The scandal has dominated South African politics for months. The Gupta family is accused of benefiting from ties to President Jacob Zuma by gaining government contracts and political appointments within the government. The ongoing probe is also being fueled by emails leaked to local media between Gupta family members and top officials in Zuma's party, the African National Congress. The emails appear to demonstrate the close business and personal relationship that exists between the Guptas and the government. President Zuma has survived a series of parliamentary votes resulting from the controversy that could have led to his removal. He has long denied allegations of corruption between his office and the Gupta family. Earlier this year, he said that the leaked emails should be the subject of a judicial investigation. The Gupta family, through their lawyer, has called the leaked emails "fake news" and repeatedly denied allegations of corruption. The family runs a business empire that spans media, mining and energy. KPMG dismissed its leadership team in South Africa last week after an internal investigation concluded that its work for Gupta family businesses did not meet its standards. "While the investigation did not identify any evidence of illegal behavior or corruption by KPMG partners or staff, this investigation did find work that fell considerably short of KPMG's standards," it said in a statement. It said its audit teams "failed to apply sufficient professional skepticism and to comply fully with auditing standards." Separately, KPMG acknowledged that a report it prepared for a government agency had unfairly maligned a political opponent of the president, former finance minister Pravin Gordhan. KPMG has denied, however, that its services helped Gupta family businesses avoid paying taxes. John Veihmeyer, chairman of KPMG International, said in a statement on Tuesday that the firm had "made serious mistakes" in "decisions made, over time, to continue working for the Guptas." The German software firm suspended four executives in July while it conducts an investigation into its South Africa operations. The company has not yet announced its findings. It declined to comment further on Tuesday. The British public relations firm collapsed earlier this month after it produced a campaign for a Gupta-owned holding company that exploited racial divisions in South Africa. The campaign allegedly sought to divert attention from President Zuma's troubles. The U.K.'s Public Relations and Communications Association (PRCA), an industry body, subsequently terminated Bell Pottinger's membership for five years. "Bell Pottinger has brought the PR and communications industry into disrepute with its actions, and it has received the harshest possible sanctions," the PRCA said in a statement. The PR firm admitted before its collapse that it had executed an "inappropriate and offensive" social media campaign related to race. -- David McKenzie contributed reporting.